Unless you’re a female needing an emergency makeup check, you may not understand the value of a powder room or half-bath. These smaller bathrooms are often overlooked when it comes to bathroom remodeling. Although they’re not the “showcases” of a home, and sometimes even tucked away or hidden in a long hallway, these small bathrooms can really add to a home, and give homeowners a great way to express themselves. Make a statement with your half-bath! Powder rooms or half-baths are a great place to take chances in bathroom remodeling. If you have ideas that you didn’t want to risk with the larger bathroom remodel, consider trying them in your smaller bathroom. Ideas like creative uses of tile, or a fun wall application, can be “tested” in these smaller rooms. And what we’ve found is that when homeowners step out and make a statement with their half-bath, they try and make sure every guest has a chance to see it. Make the Sink Your Centerpiece. Hide the Toilet. Because you don’t have as many elements in a small bathroom remodel (no cabinets, tub, shower, etc.) – you have to lay out your bathroom so that it makes sense and is easy to use. 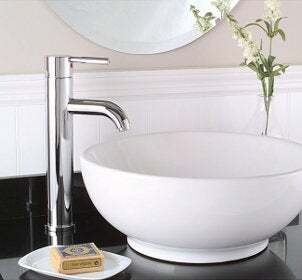 Your sink should be the centerpiece – whether it’s part of a vanity or a freestanding piece. Then, place your toilet off to the side, or in an area that’s not visible when the door is ajar. Once you’ve thought through the placement of your sink and toilet, then plan where any other items will go, such as cabinets and mirrors. Use Cool Materials in your Small Bathroom. Don’t give your small bathroom a “small bathroom” complex. Use cool materials to dress it up. Because the room is small, you don’t have to spend a lot of money to put in nice features. 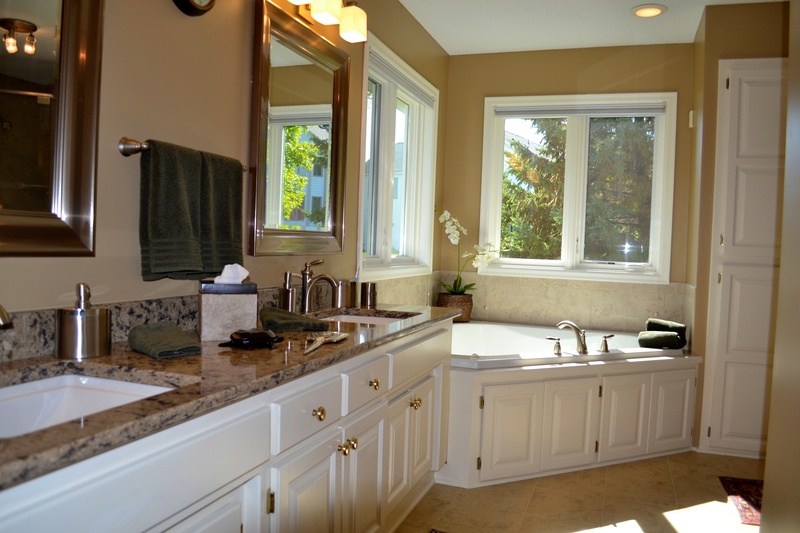 Consider accenting the sink with a granite or quartz counter top. Bring in unique antique pieces – or modern pieces – depending on your style. Think about using a really cool mirror or side-table to accent the room. Use nice tiles and fixtures. Get a unique toilet. It will be worth it. Let in Light to your Small Bathroom. Because these rooms are often tucked away into hallways or small spaces, small bathrooms can lack natural light. When remodeling your small bathroom, consider how to add light. If your bathroom is placed right – and your budget allows – think about installing a window or solar tube. Or – try to add some ceiling lighting. If that’s not an option, make sure you have plenty of wall-mounts that add lighting. To improve the ambiance and light, paint the room with a light and bright color. If your paint color is on the lighter, softer side – your room will look bigger and brighter. These are just a few ideas for how to amp up that powder room and transform it into a bathroom you love – and want to show off. Hate Your Small Kitchen? Here’s Where to Start When Remodeling. We’ve previously talked about kitchen zones, and how the use of today’s modern kitchen has changed. An open layout for a kitchen will be very important to homeowners who plan to use the kitchen as a hub for household activity. An open layout will be more pleasant and inviting. Kitchens are used for working and socializing these days – on top of eating. Your kitchen may be used for entertaining, homework, television watching or a combination of the above. By creating more open space, you maximize your investment when you redo your kitchen by designing a space just about every family wants. Can more than one person work in the kitchen at once? Is it easy to prepare meals? Can you easily transfer boiling water to drain in the sink, or even fill a pot with water to boil? All of these factors may improve the functionality of your kitchen. And by making your home more efficient, may improve your resale value. Consider the placement of each appliance, and maximize the space! Think about how efficient your kitchen is, and plan your remodel to get the most out of every cabinet, appliance and square footage of your kitchen. Simply put, better materials will sell when it comes to your kitchen remodel. Everything from what you choose for counter tops, custom cabinets and flooring will matter when it comes to how your kitchen looks – and how much you’ll get back out of it when it’s time to move on. Appliances will also carry a heavy weight, as trusted, well-known brands will be more attractive to home buyers. Better materials won’t only last longer – but will also help sell your place, too. Those are four tips for helping you get started on your kitchen remodel. Let us know if you need more advice, or have a specific kitchen remodeling project in mind! Why Choose A Design Build Company? You may have heard about Design-Build, but may still be wondering why to choose a Design-Build company. To put it simply, we make home remodeling a simple and easy process. In the home remodeling world – we work like the wedding planners. We’re involved in remodeling from start to finish, and use our relationships to get the best deals, with the smoothest process. Does It Cost More To Use Design-Build? If you’ve used a travel agent before, you may have been surprised to find that your trip may actually cost you LESS than it would have if you’d arranged it yourself. Each agent has relationships with the travel spots and can easily arrange great deals through the hotel, airlines and rental cars so that your package is one fee, and much cheaper. The same idea works with us. First, a homeowner doesn’t need to hire an architect AND a separate contractor. Also, many of the Design-Build firms credit the cost of the design process against the project cost. By using our home contractors, we design elegant home remodeling jobs and then use our extensive network to get you the best materials at the best prices. In our busy lives, simplicity is the goal for most of us. If you desire to remodel your kitchen or bathroom, consider working with Design-Build to get the outcome you want. We’ll work with you each step of the way to get you a beautiful new kitchen, or new bathroom, that will truly enhance your life with the least amount of stress possible. Just watch a few episodes of Property Brothers and you too will be wanting a new kitchen. Many popular design shows on HGTV would give anyone the itch to remodel their homes – and especially the kitchen areas! Kitchens are a very popular area to remodel. 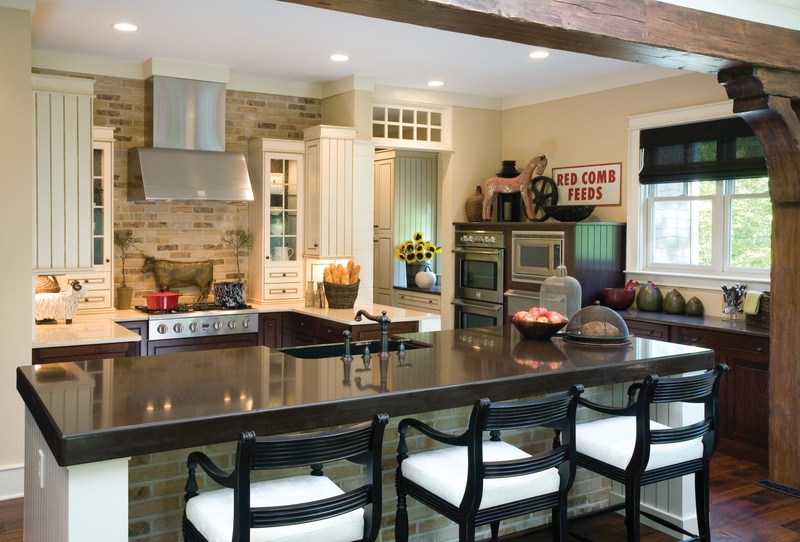 For one, remodeling your kitchen is at the top of the list on how to increase your home values. And two, many updates have been made to kitchen designs to increase functionality and usability. We all want a new kitchen! Researchers at Cornell University developed the triangular kitchen model in the 1950s. Their idea was to create a layout and reduce the number of steps you take when preparing a meal and then cleaning up. That meant the fridge, sink and stove were all configured in a triangle or “U” shape so that you could quickly get around the kitchen and then pick up once you finished your meal. Formal dining rooms were built off the kitchen for eating, so the kitchen was mainly used for food preparation, storage and cleanup. As the decades have gone on and culture has changed, families have begun to use kitchens for more than food preparation. Blame it on McDonalds if you will, but in many American homes, more school work is done in the kitchen than baking. Now, kitchens are used for all sorts of activities. Entertaining, watching TV, reading magazines, eating, and then of course food prep, is now done in the kitchen. These new trends have caused kitchen remodelers to re-think kitchen design. Gone are the goals of reducing steps in the kitchen. Now, the goal is to provide open and functional spaces so that everyone can use the kitchen. In the remodeling world, we call it “zones,” or creating usable spaces within your new room. 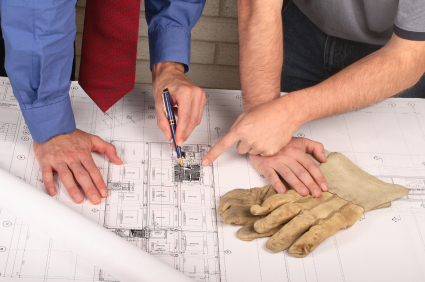 When beginning a kitchen remodeling project, we first start with mapping out the idea of traffic flow. Host Danny Lipford of “Today’s Homeowner with Danny Lipford,” recommends carefully considering how you’ll use your kitchen space before remodeling. He suggests kitchen islands for families who need extra seating, serving space and storage. It’s important to think about all the ways your kitchen will be used, and then plan the features your remodel will include. In a recent news report, Consumer Reports gave advice for avoiding common kitchen remodeling mistakes, with many of them involving poor planning and layout. Before you begin ripping out cabinets and pouring money into a kitchen remodel, make sure you’ve thought out how you’ll use your kitchen, and how to get the most use out of your new space. You and your family will love it. In the Twin Cities area? Contact us to help you plan your kitchen zones for your kitchen remodel. Custom cabinetry is a true luxury. Not only will customizing your cabinets give your room a refreshed and updated look, but it also gives you the functionality that you desire. Nothing is better than having all of your kitchen and bathroom cabinets in the size and locations you need them. We work with our clients design both kitchen and bathroom cabinetry. As design consultants, we help you lay out your room and plan your cabinet location and design so that your organizational goals are met. Not only are our cabinets functional, but they’re also beautiful. We work exclusively with cabinet builders Lakeside Cabinets for our kitchen cabinets or Bertch for our bathroom cabinets, and oversee that the cabinets are built to customized specifications in the design. 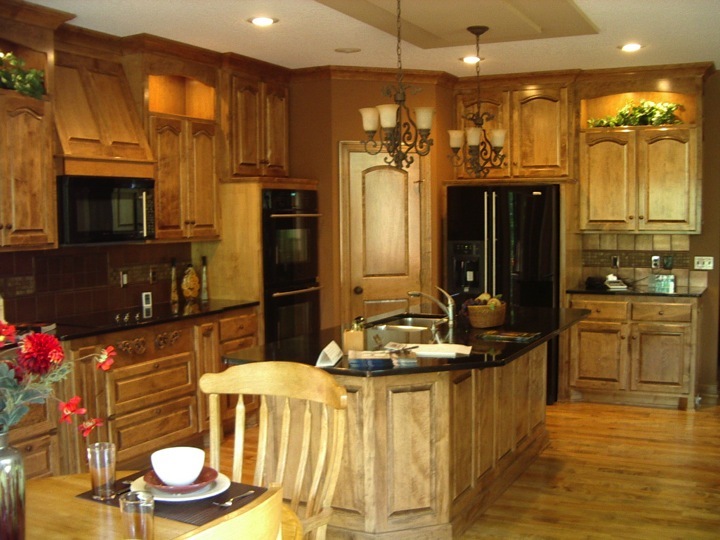 As the homeowner, you have complete control of the style, layout and finish of your cabinets. We help you design the cabinets for your kitchen or bathroom, and then provide suggestions for the style and finish of the cabinets. Using our experience, we will provide recommendations based on what matches your room and aesthetic. But although we provide recommendations, you always have the final say when it comes to your custom cabinets. How Do I care for my Custom Kitchen Cabinets? It’s critical that you take care of your custom cabinets in your kitchen and bathrooms. Custom cabinetry is a large investment, and so we recommend following the steps to make sure your cabinets continue looking new. Wipe off smoke residue, cooking vapors, or body oils with a damp cloth and a small amount of high-quality furniture cleaner. Avoid placing small kitchen appliances under cabinets where heat or steam is directed onto cabinet surfaces. Do not use products with bleach, ammonia or abrasive additives. Never use scouring pads, steel wool or powdered cleaners. Check out the Lakeside Cabinets Kitchens gallery. See some of Bertch’s Bathroom Cabinets.